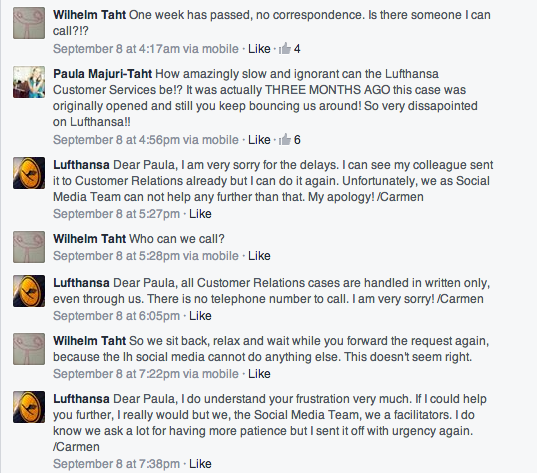 #LufthansaFAIL: Why You Cannot Separate Customer Service and Social Media? I am usually not a fan of writing how different brands “fail” on social media. Too often these fails are actually quite trivial and more driven by the urge of “social media experts” to nitpick on every thing. However sometimes you just stumble on things which are quite hard to believe that are still happening in 2013. Because this is all public correspondence from Lufthansa wall (part of the #fail-part), I have not censored any names or such because it is public post. Good answer. 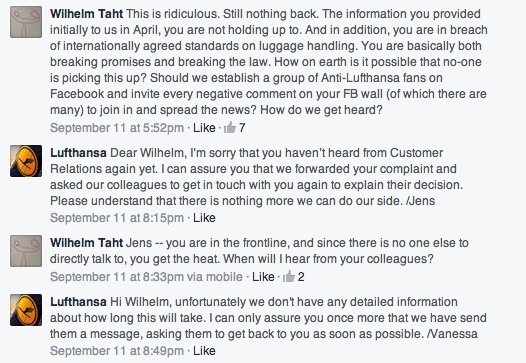 Now Lufthansa would just need to make the final reply and everything would be ok.
After this something totally peculiar happens: Lufthansa Facebook team goes totally quiet. Maybe they counted that the situation will eventually die down. But as you can notice from this post, the discussion did not die down. It actually just got more vivid. People started to share this post in social media and now it has garnered almost 100 likes and 72 comments. The post has not been taken down (not that it would probably help in this situation) or not addressed in any way. If you decide to ignore someone in social media, you should make that decision first and not halfway through. 1. You cannot have the cake and eat it too. It is impossible to just get the “good” side of the social media such as likes and positive comments. Your Facebook page is also customer service channel whether you have customer service working in your social media team or not. This correspondence shows that the company treats social media as a nice sugarcoating and not really a part of the business. You have to also be accountable for your answers. If you say you are getting back, you really should get back. You do not really need social media expert to tell this. It is just common courtesy and common sense. All the customers are not equal. You should treat those better who pay more (your best customers) and you should also treat those first who can cause you the biggest damage (damage prevention). This post has been escalating for three weeks and I do not doubt that it will escalate further. How difficult it would just to get back to the guy? It is of course respectable to have open unsolicited discussion on your Facebook page. In this case, the situation just looks bad and shows more that you do not care about customers. Also although the discussion does not show in your FB front-page it does not mean that it is forgotten. Currently the whole discussion sends the message that anyone in the organization does not really care. Airline industry is one of the most complained industries in the world and I have had my fair share of challenges with them. Nothing new under the sun in many ways you could say. This situation could have been saved easily on many occasions during this discussion (not to mention the thing has been boiling for three months before). The situation can of course be saved, but it is much harder now. 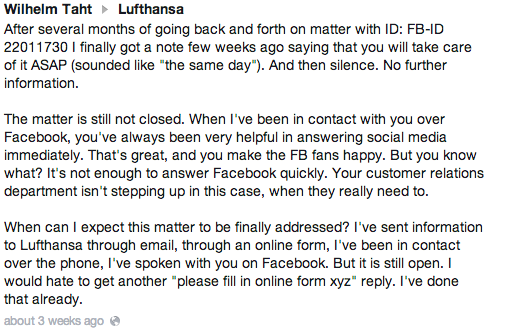 I am looking forward to how Lufthansa will respond. At least they have been pondering for the right comment for 1,5 weeks. If you are working in advertising it has been hard to avoid the new Chipotle ad. All the praises have been duly deserved; it is really great piece of work. Seldom you get such a wide variety of feelings by watching an advertisement. Which is really refreshing. Ad made me want to cry and also to have a burrito to wipe those tears with. There is a wide range of human emotions that trigger people to buy (both positive & negative). Unfortunately, too few advertisers are venturing outside the “smiling happy people”-convention and end results are boring at best and disastrous at worst. Insight: Often to define yourself, it is more important to state what you are not than what you are. The majority of the ad is about everything that Chipotle does not represent (or at least say they do not represent). Like Simon Veksner pointed out in his blog, it is dramatizing the negative. Which is the only proper way for challenger brand to behave. Old habits die hard, so you need to aggressively point the problems in incumbent. Saying happily that you are alternative, is not sufficient. If you are challenger brand, you have to challenge. Scarecrow campaign is a great example of integrated approach. The video is just the starting point to play Scarecrow-game and the loop is nicely closed when you win the burritos after you finished all the stages.